Carrie Bradshaw Made Me Do It. 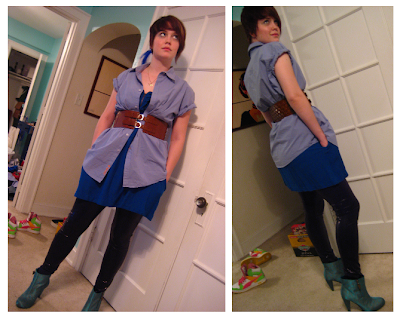 : Outfit Attempts. 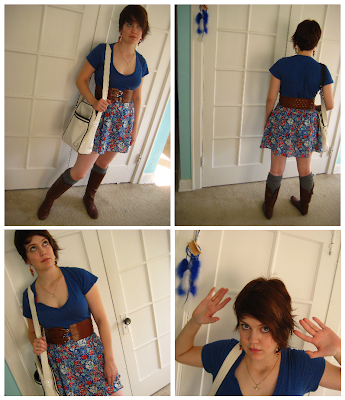 These are a few pictures from days this week when I felt I looked slightly more together than usual. Slightly. You'll have to click the photos for bigger images. This is me feeling, and therefore looking, awkward for the camera. I used to do some modeling (serious). You can totally tell. It's all in the fake smile (sarcastic). Here I wasn't wearing anything special, kind of an everyday outfit for me. But I felt good that whole day, so I figured it was as good a time as any to take a photo. The next night I felt like trying something weird. I just found the coolest faux reptile skin leggings at F21. They fit kind of oddly (super tight on top, kind of baggy on my skinny ankles) and I wasn't sure what to do with them. I feel like I kind of overdid it here, but for walking down the street for a few drinks at a bar it was perfect and weird. Kind of a throwaway night because we went out so late, and I felt like I could get away with anything. I think I took an orange clutch, too, actually. I'm such a cartoon. This next one is from yesterday, when I took the day off. The t-shirt is my favorite- it's organic, from a company called Thread for Thought. I got it at TJ Maxx for around $5. The skirt is from F21, a recent purchase. It was on sale for $6. At the movies, a short little usher dude came out of the bathroom, stopped, and told me he loved my outfit and that I looked great. This is currently my favorite outfit, bigtime. My hair was being funny- it's not usually so... lopsided? Is that the word? Finally, a picture of the boots. I'm still trying to decide on them. All the pictures from the week ended up slightly blurry, but the boots got the worst of it. This is the least blurry photo. 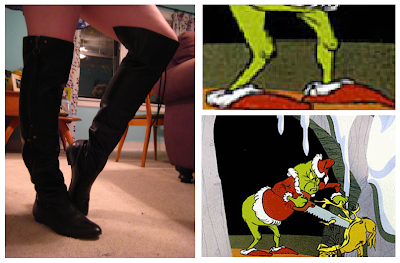 I'm slightly concerned that my boots look like Grinch feet. The long, narrow, pointy toe throws me off. Tell me I'm nuts? Also, today I managed to get two more basics checked off my list. I now have a pair of thick, black sweater-ish tights and a pretty sweet blazer. Go me! I'm with the movie usher - that outfit is so cute! I love the double buckle belt. I know lots of people with a strong aversion to pointy-toed shoes, but I like them because I think they make me look taller, somehow. You will have to post bigger pics of the snake skin leggings, all the detail is lost in the tiny pics! You're nuts. The boots are sick, where are they from?! The third outfit down is my favorite. Perfection. Yep, you're nuts. The boots are fantastic! The second and third outfits are my favorites. You're too cute. What I Wore All Weekend.